If you’re the kind of person who hates wrapping your hands around a warm cup of invigorating coffee to get your daily dose of caffeine, how about tossing some caffeinated sugary caramel popcorn down your gullet? Frito-Lay is taking its beloved Cracker Jack brand and actually jacking it up with Cracker Jack’d, including two varieties called Power Bites that contain coffee. The new line is hitting shelves soon, reports Advertising Age, and already critics aren’t too happy about Power Bites. After all, who loves Cracker Jack the most? Kids. Which group of people has unbounded levels of energy to start with and doesn’t need any more in the form of caffeine? Kids. 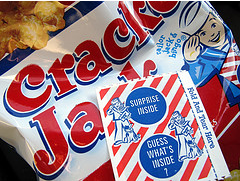 “Boxes of Cracker Jack are famous for having a toy surprise inside. But what parent suspects that Cracker Jack might come with a surprising dose of a mildly addictive stimulant drug?” the Center for Science in the Public Interest wrote in a letter to the U.S. Food and Drug Administration. “Caffeine is generally recognized as safe only in cola-type beverages and only at concentrations of 0.02% or less (about 72 mg per 12 oz. ),” the organization said in a letter to the U.S. Food and Drug Administration. Frito-Lay says not to worry, and that it’s all totally safe because there’s coffee in the snacks, and the FDA rules are against caffeine. Never mind that coffee is a natural source of caffeine. The product isn’t finished yet, but Power Bites will probably “contain approximately 70 mg of caffeine from coffee in each 2 oz. package.” That’s less than what’s in a typical cup of coffee, but not by much. Keep your eyes peeled, parents and sleepy people of the world. When Power Bites appear on the shelves we’re going to need to investigate this further. And by investigate of course I mean down a bunch of Cracker Jacks and see if it works like coffee. Also? It better still come with a prize or I’m calling shenanigans. *Pictured — normal Cracker Jacks. The others don’t exist yet!